A majority of Republicans — 52 percent — say the Supreme Court decision should not be overturned. As President Donald Trump’s Supreme Court pick readies for his eventual confirmation hearing, support for the court’s landmark ruling in Roe v. Wade has hit an all-time high. 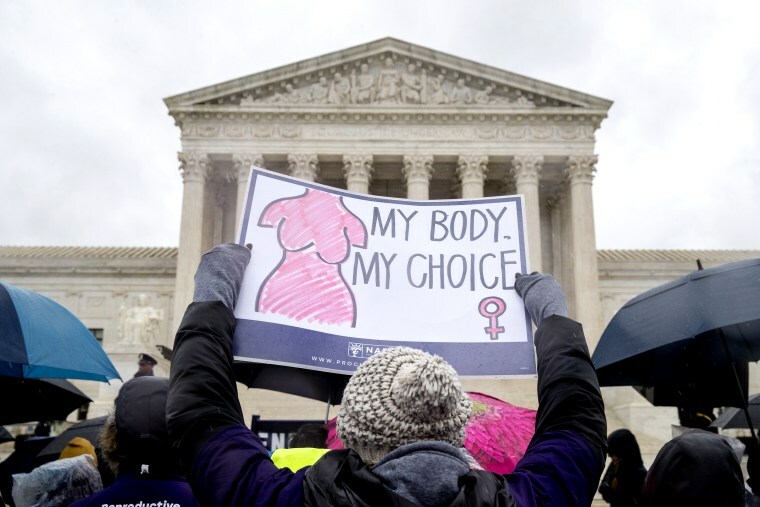 A new poll from NBC News and the Wall Street Journal finds that 71 percent of American voters believe that the decision, which established a woman’s legal right to an abortion, should not be overturned. Just 23 percent say the ruling should be reversed. That’s the highest level of support for the decision — and the lowest share of voters who want Roe v. Wade overturned — in the poll’s history dating back to 2005. In 1989, according to Gallup’s survey, 58 percent said they believed it should stay in place while 31 percent disagreed. Those supporting the ruling include 88 percent of Democrats, 76 percent of independents and a majority — 52 percent — of Republicans. About four-in-ten Republicans — 39 percent — say that Roe v. Wade should be overturned. Those preferring candidates who advocate for abortion rights include 68 percent of Democrats, 49 percent of independents and just 15 percent of Republicans. That’s compared with nine percent of Democrats, 24 percent of independents and 46 percent of Republicans who said they would be more likely to support a “right to life” candidate. Supporters of Roe v. Wade fear that Supreme Court nominee Brett Kavanaugh would rule to undermine it if he is confirmed to the high court later this year. In fact, public support for Kavanaugh’s confirmation to the court is significantly lower than it was in advance of most of his predecessors’ confirmations. Thirty-two percent of voters back his nomination, while 26 percent say he should not be confirmed (a net +6 in support.) That’s compared with 32 percent supporting and 20 percent opposing the previous Supreme Court nominee, Neil Gorsuch (a net +12 in support.) Net support for the confirmations of John Roberts, Samuel Alito and Sonia Sotomayor were similarly in double digits, although Elena Kagan enjoyed about the same level of backing in June 2010 as Kavanaugh does now — 29 percent supporting versus 23 percent opposing. Despite the controversy over the makeup of the court, the Supreme Court is enjoying its most positive public image since the poll began measuring its popularity in 1992. Half of voters (50 percent) have a positive view of the court, compared to just 17 percent who say the opposite. In July 2015, 39 percent had a positive view, while 32 percent had a negative one. That movement is largely due to much more positive perceptions of the court among Republicans, whose positions on the religious freedom of Christians and the president’s travel ban have been supported by the court in recent months.